The artist is Robin Clark and the two works on view are “Art Is Not for All” – a sentiment I can really get behind – and “Tree”…no comment. I am only going to focus on the first work with the slick exclusive title because, well…I can. This work is from Clark’s ongoing series “Erased currency” begun in 1995. The exhibition features a wall grouping consisting of ten glass vials displayed along side defaced currency, two vials for each bill. 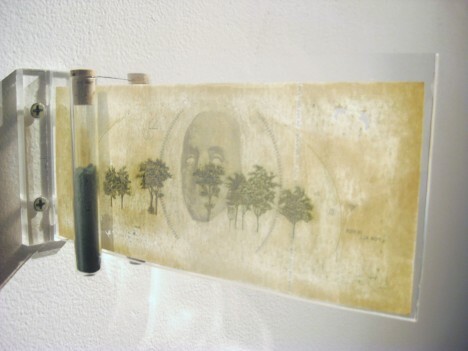 The legal tender is sealed in plexi-glass and mounted to the gallery wall with a vial positioned on either side; these contain ink dust that was removed from the currency. Clark painstakingly scrapes both sides of the bill leaving selected visual fragments behind. In one piece that is a hundred dollar bill, the dead president’s face is reduced to a hollow mask with a broken halo. The reverse side leaves us with the trees on the iconic grounds of independence hall. While “altering” currency or devaluing objects is nothing new, this particular project is done with finesse unlike other artists famous and not so famous- Mark Wagner for example who pushes the cutesy button far too often or Ai Weiwei whose outright destruction of a timeless Ming vase was just politically and culturally crass, childlike in some respects so I guess we could label it cutesy as well. With this in mind, It has been said time and time again that time is money and if this is true then Robin Clark with his incredibly labor intensive process has certainly created far more than he has destroyed.